Hailing from Multan, was born on 22 June 1956 at Murree, Pakistan. Received his early education at Aitchison College, Lahore. Holds a Bachelor of Arts from Forman Christian College, Lahore and a Master's Degree in Law & History from Corpus Christi College, University of Cambridge. Started his political career in 1983 from the District Council from where he progressed to the Provincial Assembly. Remained a member of the Punjab Assembly for nine years from 1985 to 1993 and served as Minister of Planning and Development; and Minister of Finance of Punjab. Also served as Mayor of Multan from 2000 to 2002. Has been elected 5 times as Member National Assembly from Multan in elections held in 1993, 2002, 2008, 2013 and 2018 and has also served as the Minister of State for Parliamentary Affairs in the Federal Cabinet from 1993 to 1996 and Minister for Foreign Affairs from 2008 to 2011. Took oath of office as Minister for Foreign Affairs for the second time on 20th August 2018. Presently is also Vice Chairman of Pakistan Tehreek-e-Insaf and an avid agriculturalist. 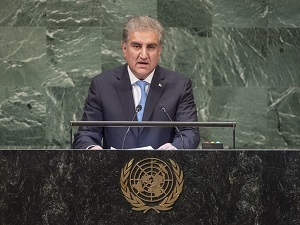 Foreign Minister Qureshi is married with two daughters and a son.